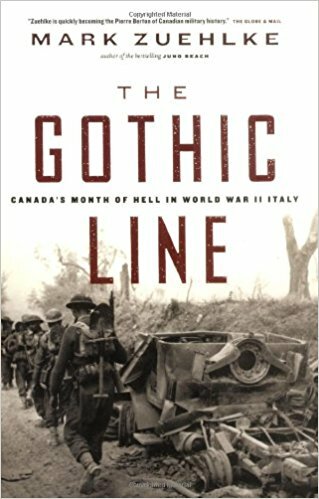 Like an armor-toothed belt across Italy’s upper thigh, the Gothic Line was the most fortified and fiercely defended position the German army had yet thrown in the path of the Allied forces. On August 25, 1944, it fell to I Canadian Corps to spearhead the famed Eighth Army’s major offensive, intended to rip through it. The 1st Infantry and 5th Armored Divisions advanced into a killing ground covered by thousands of machine-gun, antitank gun positions, and pillboxes expertly sited behind minefields and dense thickets of barbed wire. Never had the Germans in Italy brought so much artillery to bear or deployed such a great number of tanks. For 28 days, the battle raged as the Allied troops slugged an ever deeper hole into the German defences. The Metauro River, the Foglia River, Point 204, Tomba Di Pesaro, Coriano Ridge, San Martino, and San Fortunato became place names seared into the memories of those who fought there. They fought in a dust-choked land under a searing sun which by battle’s end was reduced to a guagmire by rain. But they prevailed and on September 22 won the ground overlooking the Po River Valley, opening the way for the next phase of the Allied advance. A French boy, who wears a Scottish glengarry, saluting Canadian soldiers, Boissons, France, 19 June 1944.